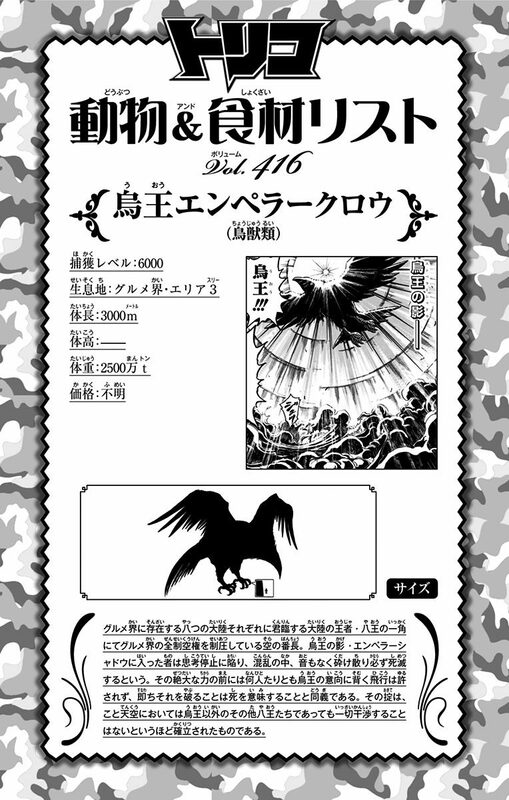 The "Bird King" is the most powerful Emperor Crow and the ruler of Area 3. Its power and absolute lordship over one of the major continents of Gourmet World make it one of the mighty Eight Kings, the eight most powerful beasts in the world. Shadow of Death: The Bird King creates a powerful miniature sun of concentrated light energy, which in turn gives creation to shadows. Those who find themselves in these shadows are ravaged to non-existence by the energies generated by the Bird King's miniature sun. Due to its ability to spread deadly poison with just a flap of its wings, it is said that all creatures entering the shadow cast by the Bird King will stop thinking and die. Emperor Shadow: By using its powerful Appetite Energy, the Bird King creates a ball of energy that emits a light so bright, it can be considered as bright as the sun. By emitting the light, the Bird King casts its shadow throughout all directions, preventing opponents from avoiding its shadow.